Like a sea of gently undulating waves, the rolling hills of the Kraichgau rise and fall between the banks of the Rhine and the Neckar Rivers, stretching from the Black Forest in the south to Odenwald in the north. Your first impression of the Kraichgau countryside may be one of a sleepy, pastoral place ideal for farming and hiking or cycling along sunny paths through quaint but not-too-exciting villages. You wouldn’t be entirely wrong, because its climate and fertile soils make it prime agricultural country. The vineyards and fruit orchards of its Neckar River region and the asparagus and cereal crops of its Rhine River region are among Germany’s most abundant. The region’s second-largest city, Bruchsal, with its 18th century Baroque palace is, in fact, Europe’s largest asparagus producer (and rightfully so on the Baden Asparagus Route). But there is far more to this sunny piece of Germany than its farms! Humans have been drawn to this part of Germany from the time they migrated to Europe from Africa. The earliest human remains (Homo Heidelbergensis, dating back 600,000 years) yet found in Europe were discovered near the Kraichgau village of Mauer in 1907. Just 4 km or 2.5 miles southeast of Bruchsal is Michelsberg Hill, the site of a Stone Age settlement. One of the most appealing aspects of vacationing in Kraichgau is that you can enjoy the entire region without an automobile! 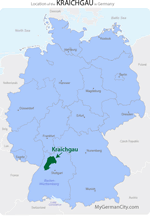 Kraichgau was a pilot region for Germany’s VIABONO Initiative, bringing its great public transport system! Use it to follow the 335 km / 220 mile Kraichgau Wine Route connecting two of Germany’s great wine-producing areas, Baden and Württemberg. In Kraichgau’s southeastern district you’ll find the Stromberg-Heuchelberg Nature Park. Thanks to its enormous number of oak trees, the Reserve has been dubbed a “Wine Forest.” The Barrique barrels in which so many notable French wines are aged come from these oaks! While you’re in the Nature Reserve, take time to see the ruins of Burg Blankenhorn. Burg Blankenhorn is just one of more than a hundred medieval fortresses scattered throughout Kraichgau. Following the German Framework Road from the River Neckar to the Odenwald will lead you to some splendid examples of Gothic and Romanesque architecture. Kraichgau is a history buff’s delight! In the region’s historic town of Bretten one of Martin Luther’s closest confidants, Phillip Melanchthon, was born. Nearby you’ll find Maulbronn with its Maulbronn Abbey, where both Hermann Hesse and Friedrich Hölderlin studied. There you can also view man-made ponds built by the monks to ensure a steady supply of fish during Lent! Kraichgau is also an ecologist’s delight. All those farmers and vintners are certainly interested in doing what is best for their land, and you can witness their efforts on tone of the regional eco-tours. Learn all about environmentally-friendly farming techniques and be treated to cooking and baking classes using the fresh produce from the farms you visit! Do you prefer water to wine? Then arrange a side trip to Kraichgau’s Brunnenregion (Water Springs Region) and the spas at Bad Schönborn and/or Bad Langenbrücken. The sulfur waters in this area have been prized for their therapeutic effects since the mid-18th century. Do you prefer beer to both wine and water? Follow the trail of the legendary “Badge Franz” (Dachsenfranz) to Zuzenhausen where you can enjoy some excellent locally-brewed beer! Arrive on a Saturday, and stop in at the town’s mill for coffee and freshly-baked cake.